JR's Paws For a Cause is a dog-friendly 5k run/walk for participants of all ages. The family-friendly, non-competitive walk/run is an event where your canine friend can participate too! Over half of the proceeds at this event, as well as our fundraising efforts are being donated to Project Samana, a veterinary out reach program that works in the Dominican Republic. Using the “think globally, act locally” concept, our goal is to reach the point so that the local projects will be self sustaining. We provide necessary medical and surgical services to the animals in the region and share animal health education for both pet owners and veterinarians. Check out https://www.projectsamana.com for volunteer opportunities! The other portion of the proceeds will be donated in Junior's (JR's) name to the National Canine Cancer Foundation. Junior was a 6 year old Labrador retriever who lost his battle to lymphoma. 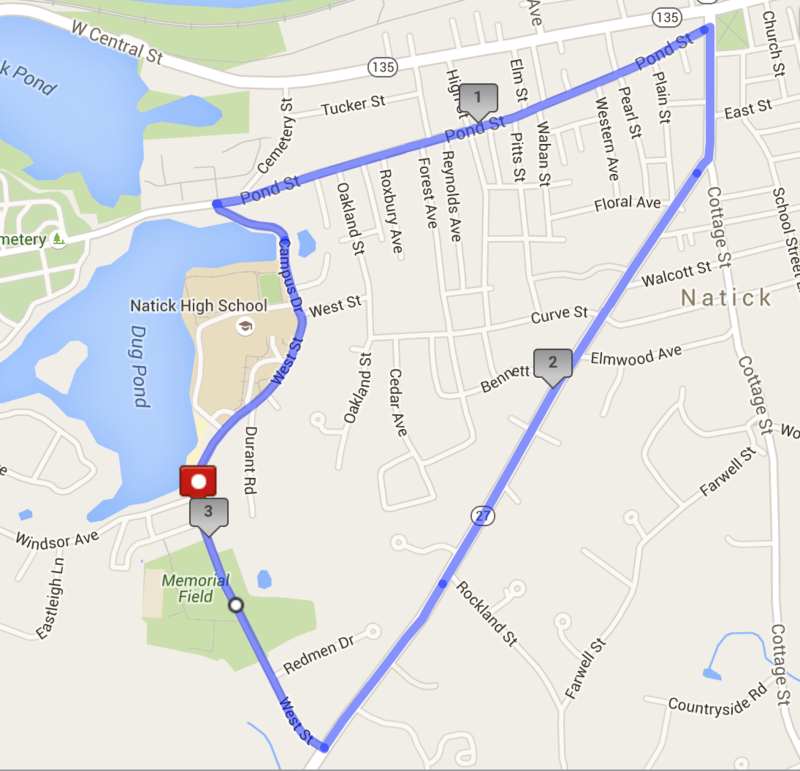 Starting and ending at the newly built Natick High School, football field parking lot, runners will follow the road by Dug Pond and then enter the neighborhood behind the High School and Dug Pond. The road then leads out to Pond Street into Natick center where runners will take a right onto Route 27 back to the High School. Road/Sidewalk will be coned off and limited if any traffic is expected. JR's Paws For a Cause 5K EVENT RELEASE WAIVER: I understand that Entry Fees are Non-Refundable & Non-Transferable. I know that running a road race is a potentially hazardous activity and I agree that if I participate in this physical activity, program, or event (Jr's Paws For a Cause) or use any Event facility or Event premises, I do so at my own risk. I should not enter and run unless myself and my pet are medically able and properly trained. I certify that my pet is up to date on all vaccinations and will behave appropriately. I understand that I may be asked to leave by any official or volunteer if my pet is misbehaving. I agree to abide by any decision of a race official relative to my ability to safely complete the run. I assume all risks associated with running in this event including but not limited to: falls, contact with other participants/vehicles, the effects of weather, including high heat and humidity, traffic and the conditions of the road or trail, loss or theft of my personal property, all such risks being known and appreciated by me. Having read this waiver and knowing these facts and in consideration of your accepting my entry, I for myself and anyone entitled to act on my behalf, waive and release all organizers, sponsors, hosts, involved parties, etc, and their representatives and successors from any and all claims or liabilities / causes of action known or unknown of any kind arising out of my participation in this event even though that liability may arise out of negligence or carelessness on the part of the companies and their representatives named in this waiver. I also agree that I, or my pet, may be examined and treated if necessary during the course of the race by qualified race personnel in the event medical problems of any cause arise. The race officials or qualified personnel have the right to remove me, or my pet, from the event if, in their opinion, I may be suffering from a life threatening condition or may be dangerous or disruptive. I hereby am llegally responsible for the actions of my dog or the dog I am running with if any incidents with another dog or human occur. I hereby grant full permission to any and all of the foregoing to use any email, photographs, videotapes, motion pictures, recording or any other record of this event for any purpose whatsoever, with or without compensation. By my signature (and/or checked agreement with online registration).